Nothing brings insurance to mind like seeing or narrowly avoiding an accident. 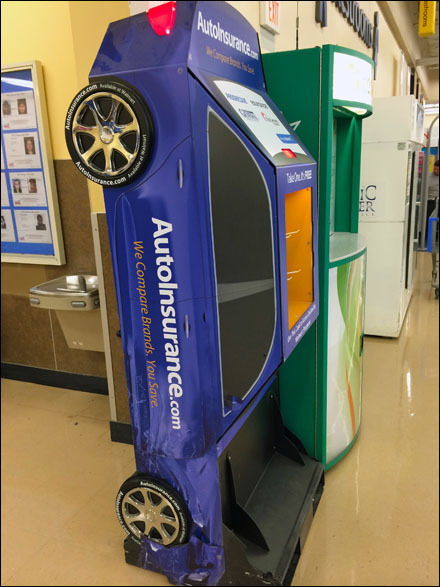 This nose-dived vehicle brings that point home dramatically as an in-store Car Crash Point-of-Purchase Display. Outfitted with Plastic Butterfly Display Hooks, you are offered a take-away card free … part gift, part Pick Card. Seen at the entrance to Customer Service where anyone queued would have time to notice and contemplate their own insurance situation. Personally as a family man my insured value is so high, the insurance companies will surely find it cheaper to clone me or transplant my brain into a new body, rather than pay out directly. If my strategy works, I am for all intents and purposes, insured to be immortal. Consider the concept … then call you agent for a Million Dollar Policy of your own.